Medicare and Medicare advantage both are very important. In the world that we live in there are and will be many challenging diseases so one should have his/her health insured so as to assure quality health facilities and treatments that would otherwise be extremely expensive. There are two such tools for a secure health insurance, namely Medicare and Medicare Advantage. Medicare is governed by the health insurance program and it is mostly covered by 65 years old people. Medicare advantage, however, is governed by private health insurance companies. Medicare Advantage plans cost less than the Medicare plans. This is a major difference that plays a vital role when people decide which one to get. To the health care providers and physicians, Medicare advantage plans offer a great number of choices. Medicare is directly administered as the traditional program through the federal government. But in Medicare advantage, Medicare benefits are provided by the plans sold by the private insurance companies. If anyone enrolls in original Medicare, it includes part ‘A’ (inpatient care for Medicare hospital insurance) and part ‘B’ (outpatient care for Medicare medical insurance); the same will be covered in Medicare advantage but it carries extra benefits such as dental and vision care. For original Medicare one can go to any doctor who accepts Medicare but in Medicare advantage, one must go to the doctors who are in the plan’s network. Moving on, to see a specialist in original Medicare we don’t need a referral but in Medicare advantage we usually need a referral. Original Medicare does not cover drugs until we take drug coverage but in Medicare advantage most of the plans do cover drugs. Services which are covered by the Medicare include hospice, emergency care, family-planning, smoking cessation programs and routine and so on. In contrast, in Medicare advantage, everything which is covered by Medicare is there plus it may also cover things like hearing; it may also have some preventive care coverage such as gym membership etc. According to surveys, user satisfaction is high in Medicare but it is very high in Medicare advantage. The funds in Medicare are collected from Medicare accounts for roughly 25% of the federal budget, Medicaid, Medicare premiums and trust fund investments but in Medicare advantage, funds are collected from subscribers in the form of premiums, public plans and care. Many people think that Medicare advantage is better than Medicare because most of the things offered by the two are same and the former goes on to offer some more things as well such as drug coverage, extra benefits including dental and vision care etc. The satisfaction levels are also higher in Medicare advantage when compared to Original Medicare which shows which one people normally prefer. 4. The original Medicare enrolls both part ‘A’ (inpatient care for Medicare hospital insurance) and part ‘B’ (outpatient care for Medicare medical insurance); Medicare advantage also includes the same but it gives extra benefits such as dental and vision care. 6. In original Medicare a referral is not needed to see a specialist but for Medicare advantage, a referral is needed. 8. Services in Medicare are as follows: hospice, emergency care, family planning, smoking cessation programs and routine; in Medicare advantage everything which is in Medicare is included and it also includes hearing, and preventive care coverages such as gym membership etc. 10. The funds for Medicare come through Medicare accounts for roughly 25% of federal budget, Medicaid, Medicare premiums and trust fund investments but for Medicare advantage the funds come from subscribers in the form of premiums, public plans and care. allana. "Difference between Medicare and Medicare Advantage." DifferenceBetween.net. 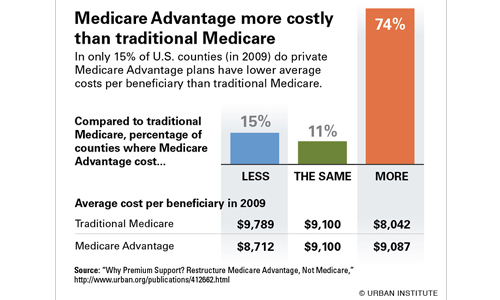 December 10, 2014 < http://www.differencebetween.net/business/difference-between-medicare-and-medicare-advantage/ >.